The NA-822 built around an Intel 3210 plus ICH9R chipset supporting Intel Core 2 Quad, Core 2 Duo, Intel Celeron E1500 and Celeron 440 processors with LGA775 socket and a 1333 MHz FSB. 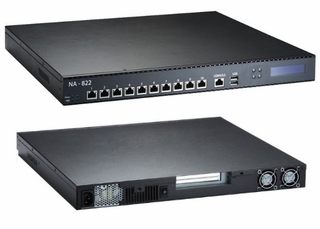 The NA-822 supports two unbuffered ECC DDR2 DIMM slots with memory up to 4GB and ten 10/100/1000Mbps LAN ports with up to 2-group LAN bypass. For storing event log data, the NA-822 has powerful storage interfaces including one 2.5" SATA HDD or one 3.5" SATA HDD, and a CompactFlash card. To prevent problems from sudden shutdown, the communication appliance supports LAN bypass function through WDT and GPIO pin definitions.